As you may know, I was bitten by the canning bug this year. 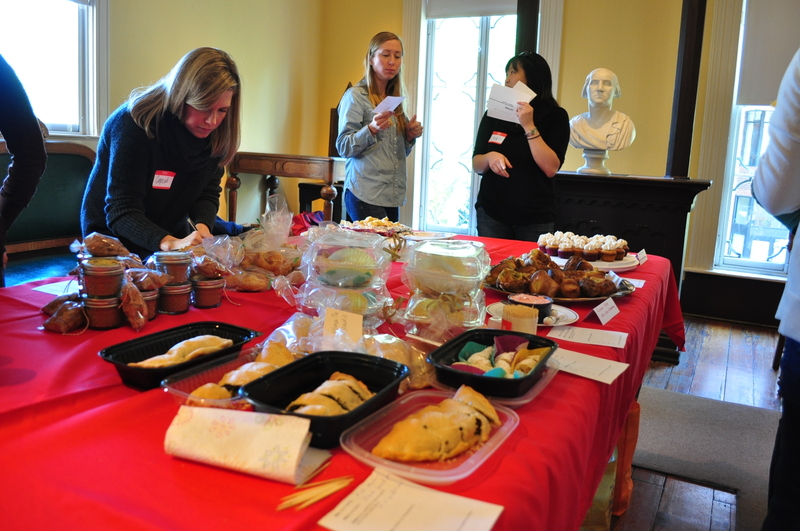 What you may not know is that the logical next step (after hosting a preservation party) is attending a Food Swap. And it’s a great step, perhaps my favorite so far (and certainly better than the peel-50-peaches step). I had the pleasure of participating in the first Alexandria Food Swap this past Sunday, expertly organized by a couple of ladies who are passionate about bringing our food systems closer to home. What better way to do that than trading food — homemade pretzels for canned peaches? — with home cooks and bakers and canners who, before the swap, had been perfect strangers? By definition, food swaps are events where members of a community share homemade, homegrown or foraged foods with one another. 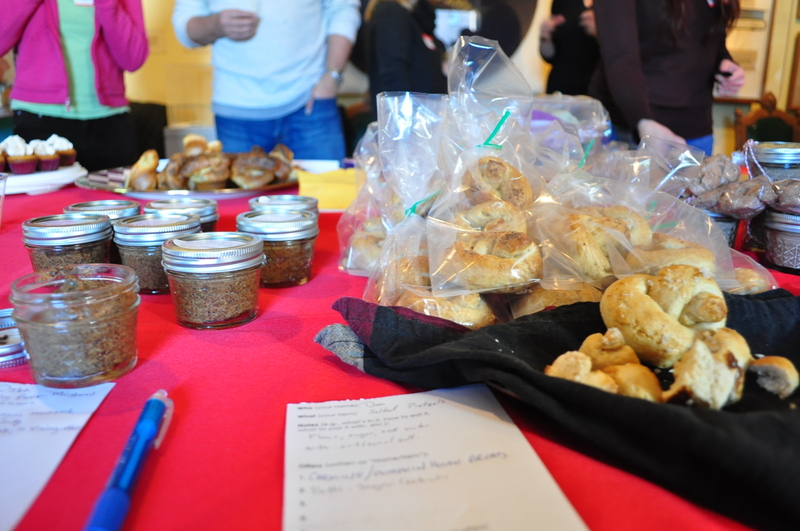 Attendees can trade their homemade items as they see fit after surveying — and sampling — the other offerings. 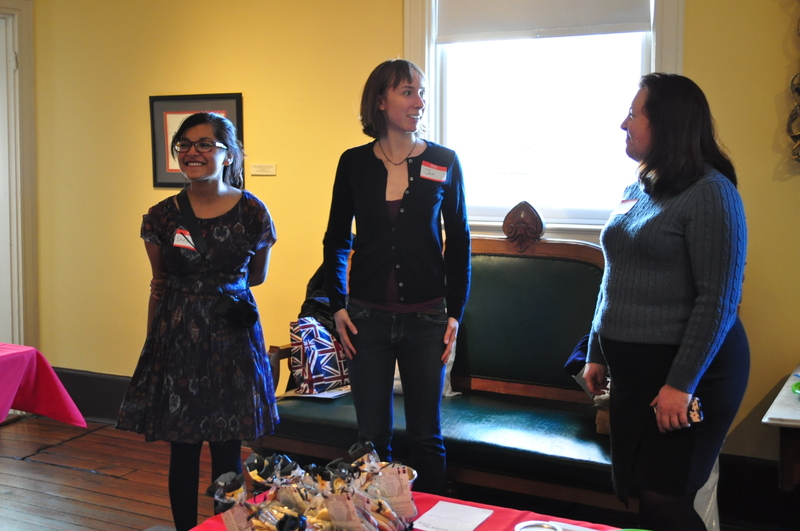 Organizers of the Alexandria Food Swap, Shelu and Jen, chat with a participant, Monica. The Alexandria event was everything I hoped it would be, and I was a little overeager with how much I brought. The organizers suggested bringing three items and 8-10 of each. I opened up my cupboard to find a nearly forgotten crate of 16-oz. peach jam jars and a few jars of dilly beans and spicy pickles. Then I had the apple pumpkin jam I made not long ago, along with some pretty cute apple fruit leathers. I knew I was going to like this event when the woman setting up next to me mentioned that she’s from Portland, she’s a chef and, oh, she brought bacon jam. “Is it too early to trade?” I thought. One of the best parts of the event was striking up conversations with like-minded, food-minded folk. We had a few minutes to mingle while we set up, and then we were free to begin sampling. There were a dozen or so participants in the swap and such a great diversity of goodies. There were savory foods like the aforementioned jam and a horseradish-y beer mustard and awaze sauce, along with plenty of confections like pumpkin bread and cocoa mix with homemade marshmallows. After sampling, participants go around and write on the sheets of items they’d like to trade in on, along with what they’d like to trade for them. With as many items as I’d brought, I could have easily traded in for everything there (which I started to do). But then I realized my first Food Swap lesson: bring a variety of sizes as well as goods. You see, as good as the gorgeous cupcakes and impressive spanikopita was, I didn’t want to trade 16-oz. of (oh remember the sweat and stickiness!) peach jam. If I had brought smaller jars, it would have been a no brainer, and then I could reserve the 16-oz. jars for trading with Shelu’s amaratto syrup, which I did. 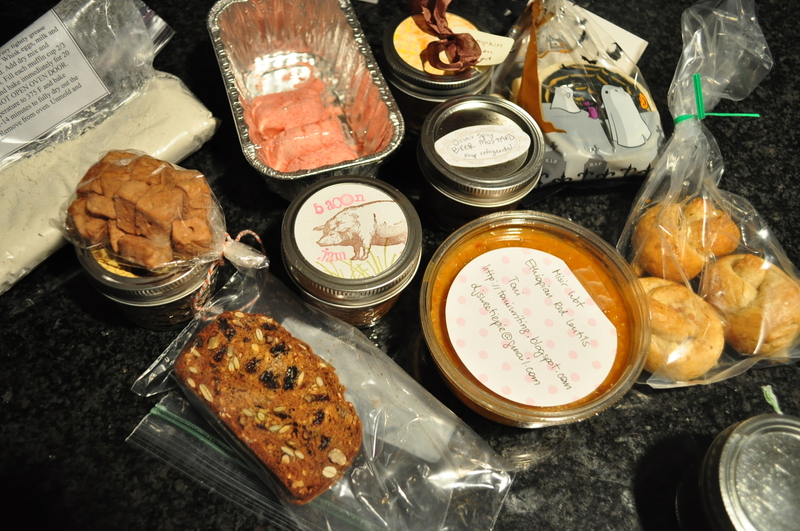 Most of the goods: a mix for amazing popovers with homemade strawberry (I think) butter, a creamy pumpkin spread, seasonal cookies, the mustard, bacon jam, cocoa mix, rain crisps, lentil soup and the pretzels, to name a few. For that reason, the smaller apple pumpkin butter jars were more of a fair trade. And I would have traded probably anything for that bacon jam… which is almost gone. 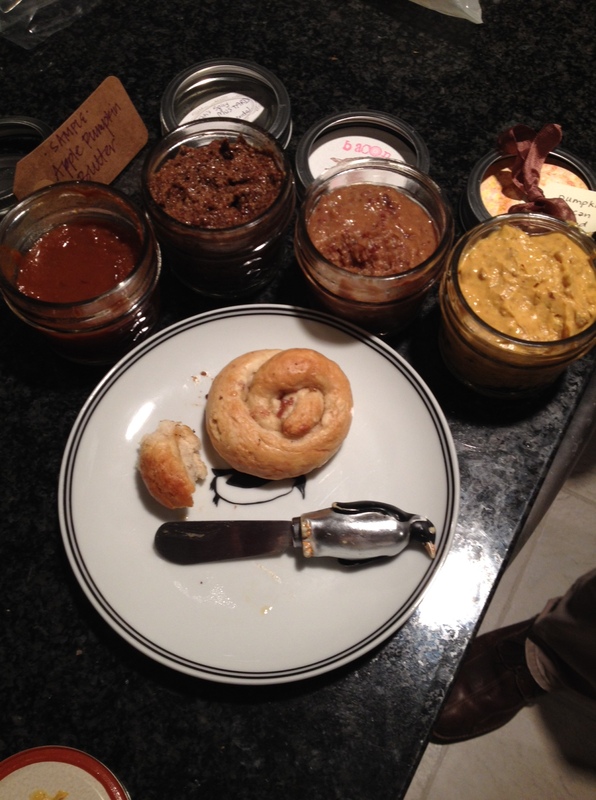 That night, my husband and I treated ourselves to a spread of spreads on pretzels seasoned with four kinds of salt, all of them homemade and only one of them by me. All that cooking and canning labor multiplied, diversified and now stocked prettily in my kitchen. Needless to say, I’m a Food Swap fan.